Through hundreds of quests, the vast open world of Outcast - Second Contact offers epic-scale adventure. Change the balance of the forces on Adelpha. Outcast - Second Contact takes place on a living world where your actions have direct and visible consequences on the ecosystem. In the near future, humanity has discovered that it is not alone in the universe - or rather universes. Alas, the first contact with intelligent beings turns disastrous when a probe sent by the US government is destroyed by the natives of a world called Adelpha. The incident creates an energy cataclysm which threatens to destroy the Earth. You are Cutter Slade, a Navy SEAL sent on a mission to Adelpha to find and repair the probe, in order to prevent this catastrophe. Welcomed by natives as the "Ulukai" - a messiah of an ancient prophecy - you will discover that the futures of Adelpha and the Earth are now linked. 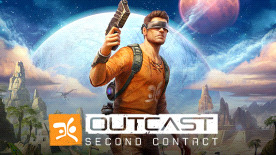 Outcast - Second Contact is the complete remake of the cult title Outcast. As the first 3D open world in the history of video games and pioneer in the modern action-adventure genre, the 1999 release won over 100 awards including adventure game of the year.